Rosemary is an essential ingredient in many gastronomic traditions around the world. Considered among the most popular aromatic herbs, rosemary also holds an important place in folk medicine. Rosemary, a perennial shrub originally from the Mediterranean region, was known to the ancient Greeks, who harvested it from the wild because of its anxiolytic and soothing properties, as well as for its culinary value. Although rosemary has been traditionally used as a healing herb, it wasn't until recently that modern science began to study the mechanisms behind its medicinal effects on a variety of illnesses. Relieving inflammation and spasms. The medicinal properties of rosemary include antispasmodic and anti-inflammatory actions, and the herb is used to treat stomach aches, renal colics, and dysmenorrhea, as well as for relieving respiratory disorders and muscle spams. Improving mood and memory. Studies have shown that rosemary properties promote overall mental health, reducing stress, anxiety, and mild depression. Rosemary compounds have also been shown to improve brain functions, including memory. Supporting the circulatory system. Rosemary acts as a stimulant, dilating blood vessels and aiding circulatory health, which positively affects the brain and central nervous system (CNS). Stimulating hair growth. Although more studies are required to validate this claim, it has been suggested that rosemary may help fight hair loss. Relieving arthritis pain. When applied topically, rosemary essential oil has proven effective in reducing joint pain caused by inflammatory diseases, such as arthritis. 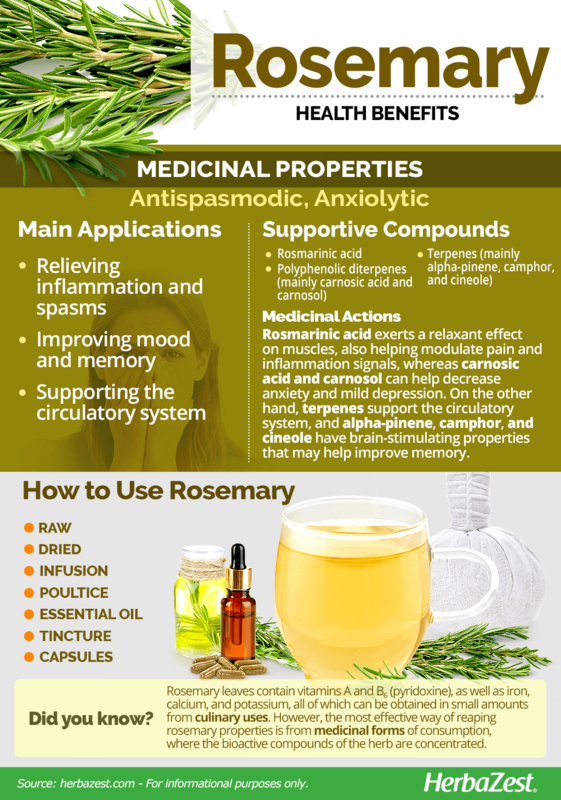 The main active ingredient behind the medicinal properties of rosemary is rosmarinic acid, which makes up most of the plant's isolated essential oil. However, a significant amount of other phenolic compounds can also be found, although the exact proportion vary depending on the cultivar. Rosemarinic acid is thought to be responsible for the antispasmodic properties of the herb. Easily absorbed by the gastrointestinal tract and the skin, extracts of rosemary have been shown to relax the muscles of the trachea and intestines, having also choleretic and hepatoprotective effects. Rosmarinic acid has been also widely studied for its anti-inflammatory and carminative properties. This compound increases the production of prostaglandin E2, which is lipid mediator that plays a key role in modulating pain and inflammation signals, and it is used in pharmaceutical drugs. A set of rosemary compounds, called polyphenolic diterpenes, have gained significant attention in recent years. The most abundant diterpenes contained in rosemary extracts are carnosic acid and carnosol, which account for over 90% of rosemary antioxidant effects. These compounds have proven effective in decreasing anxiety and mild depression, as well as showing promising results in the treatment of Alzheimer's disease. Prostaglandins are lipids that aid in recovery at sites of tissue damage or infection. On the other hand, the action of carnosic acid - which also aids the skin in protecting itself against UV rays - further contributes to the soothing and anti-inflammatory potential of Rosmarinus officinale. Other chemical components in rosemary oil are terpenes, mainly α-pinene, camphor, and cineole, which have brain-stimulating properties that have been suggested to improve memory. They enhance brain and central nervous system (CNS) functions, helping to clear the mind and increasing mental awareness. In addition, both ursolic and rosmarinic acids have shown astringent and antimicrobial activities, as they create an unfavorable environment for most pathogens. This combination of properties can bring great relief to those suffering from stomach infections, such as norovirus. Rosemary leaves also contain vitamins A and B6 (pyridoxine), as well as iron, calcium, and potassium. Herbs like linden and thyme also have strong antispasmodic properties, and similar anxiolytic benefits can be found in lemon balm and valerian. Rosemary is likely safe for most people when consumed as a food. It is also likely safe medicinally for those who take rosemary orally, apply it topically, or inhale it through aromatherapy. However, undiluted oil is likely unsafe when taken orally. Excessive consumption of rosemary can cause vomiting, upset stomach, uterine bleeding, kidney irritation, increased sun sensitivity, skin irritation, and allergic reactions. Rosemary contains salicylate, a main ingredient in aspirine, which can trigger allergic reactions in some people. People who suffer from bleeding disorders should use rosemary with caution, since it can increase the risk of bleeding and bruising for certain individuals. Likewise, those who suffer from seizure disorders should not take rosemary in medicinal forms, since it can worsen the symptoms. Pregnant or breastfeeding women should consult a physician before taking rosemary medicinally. While it is likely safe in dietary amounts, excessive consumption can cause contractions and lead to miscarriages. While rosemary health benefits can be obtained from culinary uses, the most effective way of reaping rosemary properties is from medicinal forms of consumption, where the bioactive compounds of the herb are concentrated. Raw. The raw and crushed rosemary leaves can be added to many dishes and also green smoothies. In this form, rosemary can help support the circulatory system, as well as improving memory and mood. Dried. The process of dehydration rosemary leaves undergo concentrates and preserves their natural flavor, aroma, and essential oils. In this form, rosemary can be stored for a long time and used in both culinary and medicinal forms. Infusion. Stepping the fresh or dried leaves in hot water extracts all the medicinal properties of rosemary. Sipping a warm infusion is one of the most enjoyable ways to consume this herb, as it can help reduce anxiety and stimulate the circulatory system, as well as relieving joint pain. Poultice. 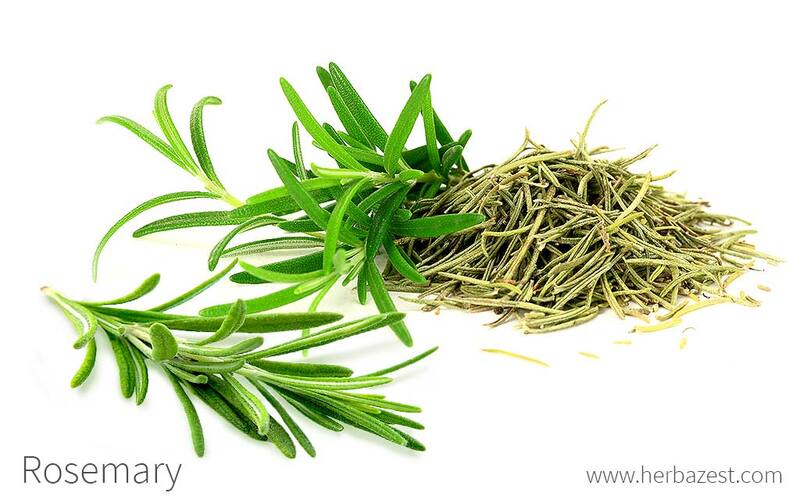 Dried or fresh rosemary leaves can be steeped for few minutes in hot water and then wrapped into a gauze. The topical application of this poultice can bring relief to joint pain and sore muscles. Essential oil. 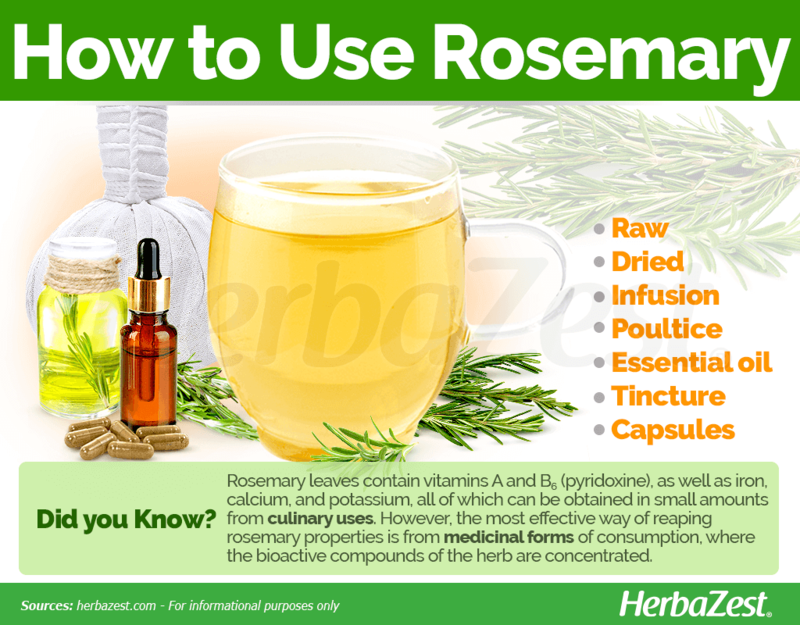 In this form, rosemary should only be applied topically or used in aromatherapy. Rosemary essential oil has been shown to relieve muscle spasms and joints' pain, as well as helping treat acne, baldness, and circulatory blockages. Tinctures. Rosemary tinctures have numerous medicinal properties, including supporting the nervous system and relieving muscle spasms. Capsules. This is the most potent form individuals can safely take orally. 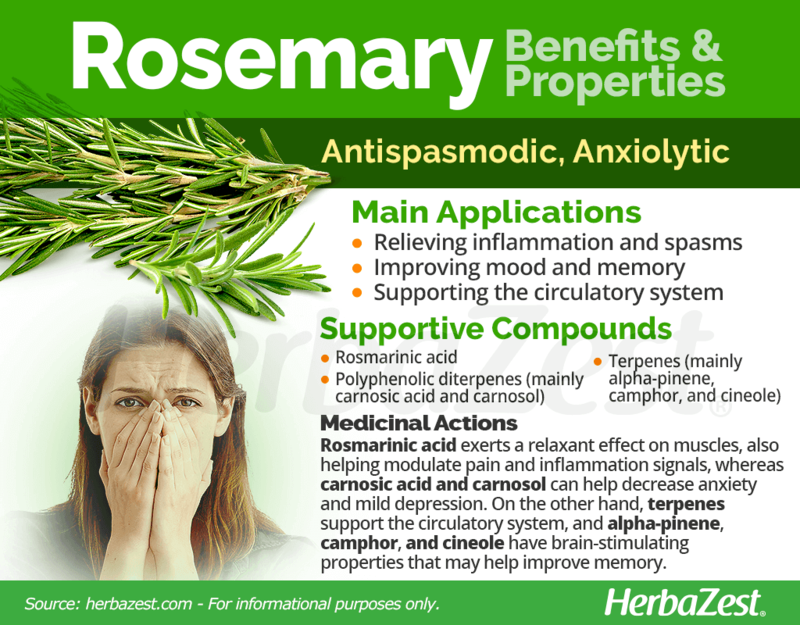 Rosemary capsules provide support for the circulatory and nervous system. While rosemary plants can be purchased in nurseries, raw rosemary leaves are easy to come by most grocery stores or local markets around the world. In addition to this, rosemary dried leaves are available in bulk or as teabags in herbal stores or online retailers. Medicinal preparations of rosemary, such as poultice or infusions, are easy to make at home. Tincture and essential oil, on the other hand, are widely available in herbal stores and online retailers, as well as rosemary capsules. It is important to seek medical advice before taking rosemary herb in medicinal dosages. Generally regarded as an easy plant for beginners, the rosemary bush is highly resistant to pests and disease. However, it is susceptible to waterlogging and requires friable soil with proper drainage. In addition, some varieties are very sensitive to frosts and can die because of them. Despite this difficulties, growing a rosemary plant can be very rewarding and a joy for gardeners to have. The rosemary plant grows best in sunny, temperate climates. It prefers a fertile, neutral to slightly acidic soil, with a pH of 6.0 - 7.0. A space of three to four feet (90 - 120 cm) between plants is recommended to give them ample growing room. The rosemary bush is not water demanding. Once established, it will require little to moderate irrigation. After the rosemary shrub flowers, regular pruning is necessary in order to control its growth. Despite being very hardy, the rosemary plant can be attacked by aphids, spittlebugs, and whiteflies. Diseases such as powdery mildew and root rot can also affect rosemary. Detailed information about growing rosemary can be found in the herb garden section. Rosemary is a woody perennial with evergreen, needle-like leaves, which contain a large amount of essential oils that provide its characteristic fragrance. The rosemary shrub can grow up to six feet (1.82 m) tall, and its flowers can be pink, purple, white, or blue. The rosemary plant is incredibly hardy and it has been known to flower outside of its typical flowering seasons. Rosemary is a member of the Lamiaceae family, which comprises about 7,200 species of flowering plants, including many other culinary herbs, such as basil (Ocimum basilicum), peppermint (Mentha x piperita), sage (Salvia officinalis), thyme (Thymus vulgaris), and lavender (Lavandula officinalis). There are more than a dozen cultivars of rosemary around the world, but the six most popular types are 'Arp', 'Spice Islands', creeping rosemary, 'Erectus', 'Albiflorus', and 'Majorca Pink'. Of these, the upright, 'Spice Islands', and 'Arp' cultivars are the most used for culinary purposes, while the other ones are shorter and mostly considered as ornamental plants for landscaping. The botanical name of rosemary, Rosmarinus, comes from the Latin words "ros" (dew) and "marinus" (maritime). With one of the most varied and colored histories of all herbs, rosemary is steeped with ceremonial tradition and superstition, dating back to ancient Greece. Pliny, Dioscorides, and Galen all referenced the medicinal properties of this herb over 2,000 years ago. However, it was not domesticated into a steady crop until 13th century, in Spain, and it was during the following centuries that it was established as an edible plant and flavoring agent. The Virgin Mary is said to have spread her blue cloak over a white-blossomed rosemary bush when she was resting, and the flowers turned blue. The shrub then became known as The Rose of Mary. In the Middle Ages, rosemary was associated with wedding ceremonies. The bride wore a rosemary headpiece while the groom and wedding guests all wore a sprig of rosemary. Because of this association with weddings, the rosemary herb was considered a love charm. By the same time, rosemary was also believed to offer protection from the plague. In 1603,when the bubonic plague killed over 38,000 Londoners, the demand for rosemary was so high, that the price increased from one shilling for an armful of branches to six shillings for a handful a sprigs. Put into perspective, one fat pig cost one shilling during that same time period. Rosemary was once one of the best known remedies against nightmares, and its pleasant aroma was also thought to repel witches. The main reason for rosemary's economic importance is its production of essential oils, which are highly regarded in the culinary industry. Rosemary's oil yield can reach 0.2 - 1.3% of its fresh mass. The herb also carries value with its ornamental and medicinal purposes. Spain is the leading producer of rosemary, followed by other Mediterranean countries, Northern Africa, Mexico, and the U.S. Hair and scalp health. When applied to the scalp, rosemary can alleviate dandruff and improve overall hair and scalp health. Cosmetics. Rosemary is often added to different lotions, cosmetics, and other homemade body products because of its pleasant aroma. Pest control. The rosemary plant is used as a mosquito repellent. It can also ward off mice and other pests in the home. As an Air-Freshener When mixed with other ingredients, such as citrus fruits or vanilla, a sprig of rosemary can be used as a strong air freshener, leaving a pleasant aroma around the house. Gardening. The rosemary shrub works great as an ornamental ground cover, and because of its fragrance and easy care, it is preferred for gardeners around the world. Hormone Health Network, What Does Prostaglandins Do?